January 6-- Mr. Gary Vasser, age 55, of Vidalia, died Friday, January 4, 2019, from injuries received in an automobile accident in northern Toombs County. He was born in Vidalia, lived in Homestead, Florida for eight years, and returned to Toombs County in 1972. 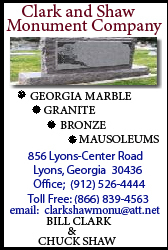 Gary was a 1981 graduate of Lyons Senior High School, and a graduate of Southeastern Technical Institute in Vidalia. Previously, Gary was shipping supervisor at Stanley Blacker for many years, and currently working as a licensed practical nurse at Emanuel County Nursing Home in Swainsboro, where he nursed with selfless dedication for the past eighteen years. He enjoyed hunting, fishing, and most sports, especially football and baseball. He was a member of the Normantown Baptist Church, and was preceded in death by his father, Lonnie Franklin Vasser; a brother, Marvin William Vasser; and a fiancé, Pamella Foskey Palmer. Gary is survived by one daughter, Chay Duffin and husband Josh of Statesboro; his mother, Quinnell Vasser of Vidalia; one sister, Gwen Vasser Braddy and husband Tommy of Lyons; one step-daughter, Pamela Blaxton and husband Lester of Vidalia; two step-grandchildren, Nick Blaxton and Cassidy Blaxton of Vidalia; one aunt, Joyce O’Neal of Ailey, and numerous cousins. The funeral service will be held Monday, January 7th at 3:00 p.m. in the chapel of Ronald V. Hall Funeral Home with Pastor Efton Green officiating. Burial will follow in the Odom Cemetery near Lyons. The family will receive friends at the funeral home on Monday afternoon from 1:00 until just prior to the service. Those desiring may make memorial contributions to the Sweet Onion Animal Protection Society, P.O. Box 210, Vidalia GA 30475 or the Paul Anderson Youth Home, P.O. Box 525, Vidalia GA 30475.